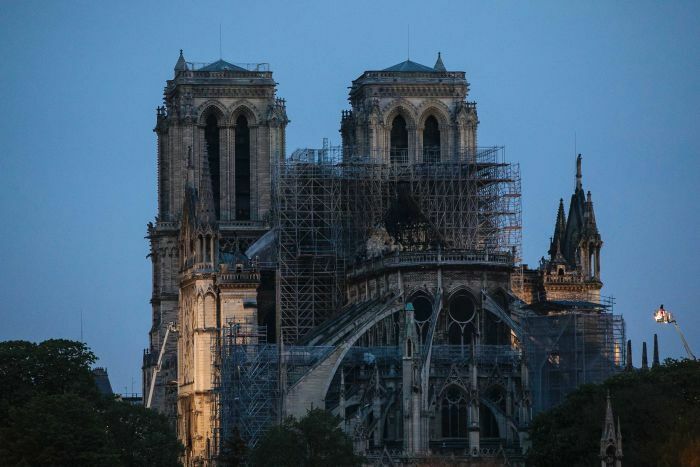 The light of dawn in Paris has illuminated some of the damage done to Notre Dame cathedral in an overnight blaze, as firefighters persist with their efforts to dampen any remaining hot spots. Crowds in the French capital sang hymns as firefighters battled the blaze overnight, while President Emmanuel Macron quickly pledged to rebuild the monument. 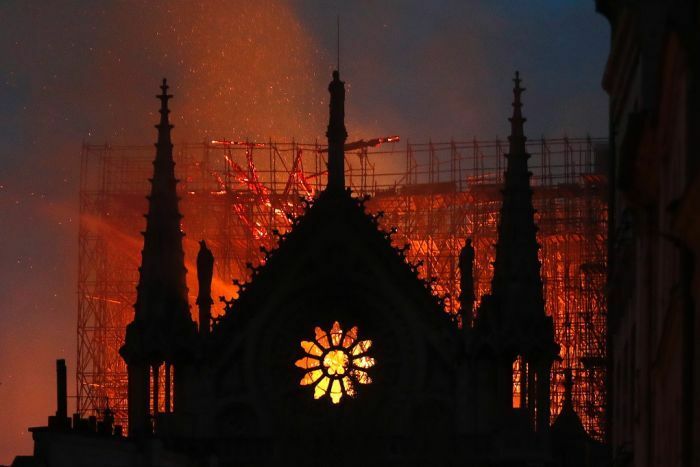 The cathedral, which has been standing since the 14th century, caught fire on Monday evening (local time) and was burning through the evening, drawing crowds of tourists and locals. In a late-night press conference, Mr Macron said the fire had burned a “part of us”, and he made a solemn pledge to rebuild it, with the aid of a fundraising campaign. French billionaire Francois Henri-Pinault had reportedly offered 100 million euros ($158 million) to help. “This cathedral will be rebuilt by all of us together. It’s part of France’s destiny and it will be our project for the years to come. I am committed to this,” Mr Macron said. “Starting [Tuesday], a national fundraising campaign to restore Notre Dame will be launched and this [will spread] beyond our borders. “We will call upon the greatest talents, and there are a lot of them that will contribute, and we will rebuild. 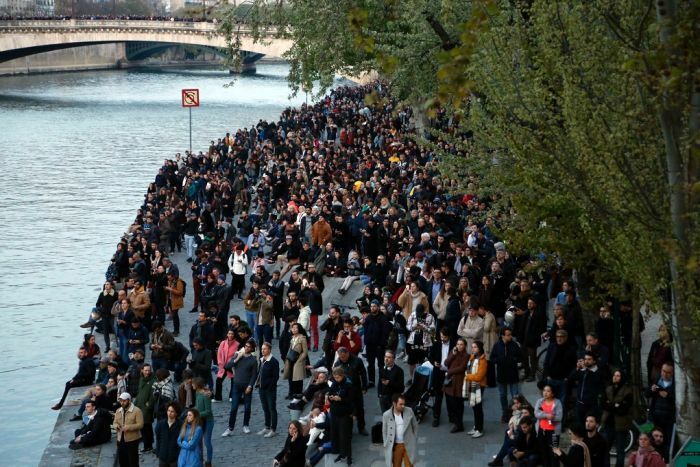 Thousands of people lined the banks of the Seine River around the small island on which Notre Dame stands, watching in disbelief and horror. 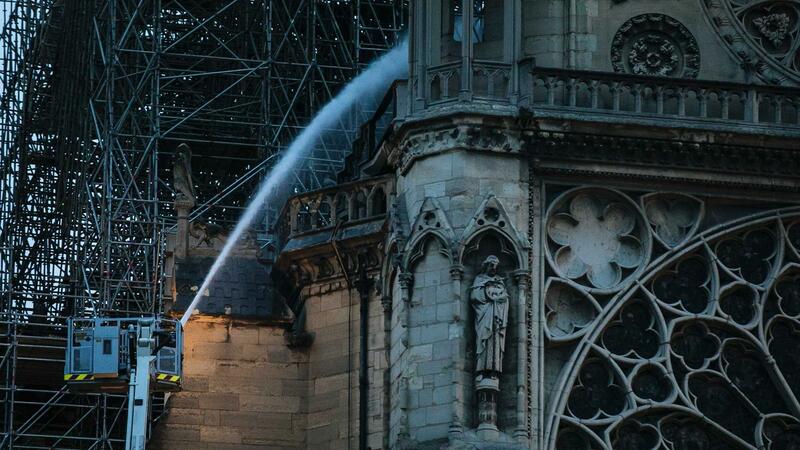 Paris Archbishop Michel Aupetit invited priests across France to ring church bells in a call for prayers, but emotions might have run highest in the crowd outside another Gothic church, not far from where Notre Dame burned. Crowds gathered spontaneously to pray and sing hymns outside the church of Saint-Julien-Les-Pauvres, across the river from Notre Dame, where people bowed their heads, kneeled, prayed and cried. “The cathedral is more than walls. It’s a symbol of Catholic France,” 18-year-old Paris resident Gaetane Schlienger said. The cathedral also called to 25-year-old Quentin Salardaine, a local doctor, as flames devoured it and coloured the sky. “I think this building just symbolises Paris, no matter if you’re Catholic or not. I’m not,” Mr Salardaine said. Blandine Bouret, 68, said she knew the neighbourhood well. Her grandfather had a small store on a street in the shadow of Notre Dame. Her father had an engraving boutique nearby. “It’s terrible, it’s catastrophic,” Ms Bouret said. 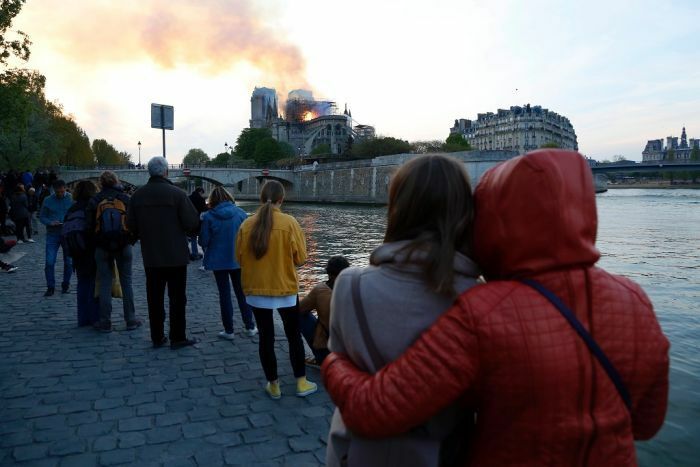 While authorities are in the early stages of their investigation into the fire’s cause, the Paris prosecutor’s office said it was treating the blaze as an accident, ruling out arson and possible terrorism-related motives, at least for now. 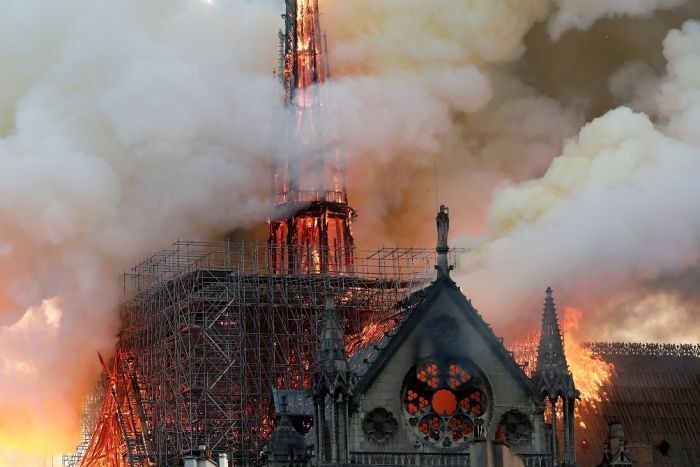 French media quoted the Paris fire brigade as saying the fire was “potentially linked” to a six-million-euro ($6.8 million) renovation project on the spire and its 500 tonnes of wood and 250 tonnes of lead.